Built by Douglas. Delivered to the U. S. Army. Ferried overseas via Hawaii to Australia. Assigned to the 5th Air Force, 374th Troop Carrier Group (TCG), 41st Troop Carrier Squadron (TCS). Nicknamed "Star Duster". Assigned Australian Call Sign VH-CGC. Took off from 5 Mile Drome (Wards) near Port Moresby flying via Cairns Airfield, Garbutt Field where the C-47 took aboard 6,700 pounds of cargo and flew to Rockhampton Airfield and was loaded with mail before departing for the final destination Archerfield Airfield near Brisbane. After take off from Rockhampton this aircraft was never seen again and disappeared without trace. The entire crew was declared Missing In Action (MIA). This C-47 broke up in mid air due to violent weather and crashed near Monto. 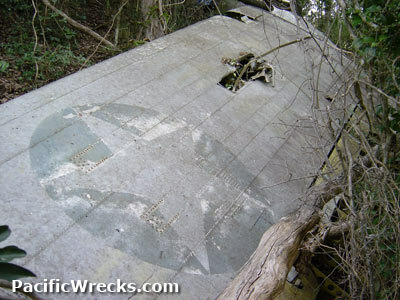 On June 22, 1948 the crash site of this C-47 was discovered by Mr. F. A. Smith roughly six miles north of a property known as "Magpie" in a steep gully between two high hills covered with trees. Smith reported the site to the Monto Police, which notified the Royal Australian Air Force (RAAF). The wreckage included the fuselage section, wings, engines and tail. One engine is 300-400 yards separate from the rest of the aircraft. Among the wreckage was the remains of the cargo including several engines, two MT engines, and one KVA unit and three large and three small cylinders for acetylene and oxygen. In 1961, the right wing, which was never found during 1948 RAAF investigation, was discovered 1km away from the crash site. In 1991, the stabilizer, fuselage door, and other fragments were found. The wide area of the wreckage further reinforces violence of this crash site. Afterwards, a RAAF Searcher Team led by S/L Kieth Rundel investigted the crash site. After the recovery of remains, the Australians and Americans aboard were buried in the Bundaberg War Cemetery in Bundaberg. During the investigation, the remains of an unmanifested passenger Cpl Peglow, was found. The investigation revealed that the aircraft probably disintegrated in midair, with both engines running, due to turbulent weather. The entire crew and passengers were officially declared dead the day of the mission. After the recovery of remains, the crew and passengers were buried at Bundaberg War Cemetery in Bundaberg. A propeller from the C-47 was recovered and is displayed at the Monto RSL. Oz @ War - C-47 "Star Duster"